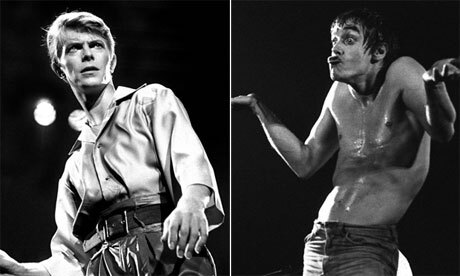 A new film will tell the story of Iggy Pop and David Bowie's years in West Berlin. The British-German co-production will be directed by Gabriel Range, best-known for his movie about an imaginary assassination of George W Bush. "[This] is not a traditional rock biopic [because] no one dies at the end," producer Egoli Tossell said. Tentatively titled Lust for Life, Range's film will explore the period when Pop and Bowie had relocated to Germany, collaborating on 1977's Low and the Stooges leader's first two solo albums. It's an era that Bowie himself has recently returned to, paying tribute to Potsdamer Platz and Nürnberger Strasse in his new single. "Berlin was the first time in years that I had felt a joy of life and a great feeling of release and healing," Bowie told Uncut in 2001. "Some days the three of us would jump into the car and drive like crazy through East Germany and head down to the Black Forest … Or we'd take long, all-afternoon lunches at the Wannsee on winter days … At night we'd hang with the intellectuals and beats at the Exile restaurant in Kreuzberg." Lust for Life's screenplay was written by Robin French, according to the Hollywood Reporter, based in large part on Paul Trynka's books Starman and Open Up and Bleed, which look at the lives of Bowie and Pop respectively. French is the co-creator of BBC3's sitcom Cuckoo. Tossell is producing Lust for Life with the British production company Altered Image. They have development funding from Creative England and the German national film board.